María C. Fernández is the senior coordinator for the Urban Youth Collaborative. Ocynthia Williams is an organizer with the United Parents of Highbridge and a parent leader with the NYC Coalition for Educational Justice. 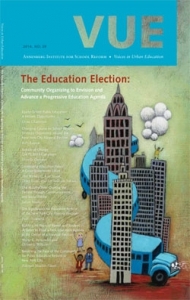 The successful campaign to position education as a pivotal issue in the 2013 mayoral campaign built on years of community and youth organizing in New York City. For over a decade, students and parents in New York City have organized in coalitions across boroughs to fight for an equitable, just school system for all public school students. In a time when the Department of Education (DOE) centralized all power in the hands of one mayor and one schools chancellor, the Urban Youth Collaborative (UYC) and the Coalition for Educational Justice (CEJ) birthed a unified, powerful educational justice movement led by those most directly impacted by the policies leaving our young people behind. Built off the victories of local organizing in the Bronx and Brooklyn, both UYC and CEJ sought to maximize the power of students and parents to challenge an administration that pushed reforms which marginalized student, parent, and community voices. The Michael Bloomberg administration reorganized the New York City school system using corporate reform strategies centered on choice, autonomy, and accountability. On the ground, this translated to waves of school closures and co-locations, over-emphasis on testing instead of teaching and learning, severe budget cuts, and the creation of a pipeline to incarceration and unemployment instead of college and careers. Student Success Centers (SSCs): SSCs are an innovative model of college access that train high school students to work with their peers to complete the college application process, from choosing a college to completing applications and understanding financial aid. The three SSCs that UYC got DOE funding for have helped hundreds of students apply to a wide range of colleges, access more scholarships, and secure more state/ federal aid for college. Safety with Dignity: Along with allies, UYC worked with the New York City Council to pass legislation in December 2011, the Student Safety Act (SSA). The SSA requires the DOE and New York Police Department to report on student safety policies in New York City schools, including student suspensions, arrests, and summonses, broken down by race, age, gender, special education status, and English language learner status. Free transportation for students: UYC led the campaign that saved free and reduced-price metro cards for 600,000 students. Extended Parent-Teacher Conferences: a $5 million initiative to offer thirty-minute, one-to-one parent-teacher conferences to the families of every child who scored below grade level on the new Common Core assessments. At these conferences, parents and teachers discuss the child’s strengths and challenges and concrete activities to do at home to help the child progress (NYCCEJ 2013). Middle Grades: the establishment of a Middle School Success fund of almost $30 million to support comprehensive reform in low- performing middle grade schools (NYCCEJ 2007, 2008). Academic Intervention Services: a DOE initiative of $10 million to provide additional tutoring to struggling students at 532 schools across the city (NYCCEJ 2011). The most valuable piece of the work for both UYC and CEJ is the intentional development of students and parents as key players in education reform. They are trained to be the experts who transform a devastated school system through powerful organizing, speaking their truths, and building with allies to push community solutions to failing policies. Students and parents are the decision makers, the public speakers, the negotiators, and the storytellers. The stories of the authors of this article illustrate the power of UYC and CEJ to effect change from the grassroots. María C. Fernández, a seasoned youth organizer who earned her stripes as a youth leader and later a staff leader with a Bronx-based organizing group, and Ocynthia Williams, a parent leader and community organizer from the Highbridge neighborhood in the Bronx – communities that have been traditionally neglected by educational institutions and government – can elevate their local education issues to a citywide platform and impact change. Fernández is the senior coordinator for the Urban Youth Collaborative (UYC). For the past eleven years, she has been organizing young people around educational justice issues, including ending the criminalization and push-out of low-income students of color in New York City public schools, implementing positive alternatives to harsh disciplinary practices, developing alternatives to the disruptive school closure policies, training and developingschool staff and administrations on youth leadership and transformative organizing, and local school facility improvements. Williams is currently an organizer with the United Parents of Highbridge and a parent leader with the CEJ. She has spent the last eight years committed to educational justice because she believes deeply in the movement and in the spirit and the strength of her fellow parent leaders. This is not a new fight, and just knowing that she is standing on the shoulders of those who devoted their lives to ensure our children have access to a just education propels her to continue in this work and create change. After twelve years of being pushed to the margins, the CEJ parents and UYC students sought the opportunity to build a more strategic education reform effort. For the first time in over a decade, New York City would have a new mayor in 2014. Even though there had been some victories and successes during the Bloomberg administration, they were not at the scale we needed in the city or the types of victories that we wanted to see. Repeatedly, the door was slammed in our faces as we presented the DOE with research-based solutions that had been proven to be effective in improving schools. The mayoral election of 2013 was key in our hopes for changing education policy in New York City. For UYC and CEJ, we had to strategically position ourselves front and center of the joint work that was needed in order to win in the city. This meant making hard decisions around our current campaign work, creating rapid decision-making structures, building coalitions with organizations we didn’t traditionally work with, and creating innovative processes for greater public engagement. For both coalitions, the 2013 mayoral election had to be about education. Base building has always been a critical component in effective organizing in New York City. More than just bodies in the streets, UYC and CEJ, through our member organizations, consistently works to build strong bases of students and parents who are committed to building power and changing education policy for our communities. An example of this happened during a bus tour that was part of A+ NYC’s PS 2013 campaign.3 In CEJ and UYC communities across the city, the community reception of the bus was powerful. Our active leaders surrounded the bus on its stops in Highbridge in the Bronx, where organizers shouted one early morning “Get on the bus. Make sure the next mayor hears your voice.” At another stop, outside the Bronx Public Library, youth leaders greeted press and local elected officials and mapped out their own visions for their public schools, while welcoming everyone to come and help to shape our collective vision for educational justice. While our PS 2013 community engagement process served as an opportunity to expand our bases in the neighborhoods where we were already active, it also engaged communities across the city that have not tradition- ally been part of our organizations, who have also been shut out of formal decision-making structures in city government and the DOE. Engaging these communities helped UYC and CEJ develop strong relationships with organizations and key community institutions we had not usually worked with and offered a space for our coalitions to expand in our membership and reach. Through the entire process, staff and leaders hit neighborhoods and communities, facilitating seventy-five workshops for students, parents, educators, administrations, and community members, dreaming together of what our schools could look like. Those same communities were then able to cast a vote for their education priorities, sending a message that New York City is united for a new progressive education agenda. Merely asking communities who have been neglected for so long for their opinions and thoughts on policies that impact them was enough to solidify powerful relationships and spark collaborations between communities and our coalitions. It was this process, this intentional engagement of New Yorkers, this process of listening, learning, and contributing together, that helped built powerful bases ready to mobilize, organize, and win. The use of harsh discipline practices, like suspensions, arrests, and summonses, in combination with the lack of social-emotional supports for students and the increase in the reliance on police and metal detectors in schools, has led to the creation of the school-to-prison pipeline. Black and Latino students, LGBTQ students, and students with special needs are disproportionately impacted by such policies. For UYC, it was critical to elevate the racial disparities in school discipline and the evidence-based positive alternatives, like restorative justice, in the public debate through the 2013 elections. School climate had always been a controversial issue under the Bloomberg administration, and rarely did students, parents, educators, and elected officials all agree on the approaches to building positive school climate. Building off years of youth organizing around transforming school climate and safety, UYC made the overuse of punitive discipline and its impact on students of color a wedge issue for the Democratic candidates. Youth leaders created materials with data and solutions for candidates, met with them and their staffers, and brought the conversation to their doors. In April 2013, a wave of school suspension and arrest data was released, as it is periodically in New York City pursuant to the requirements of the New York City Student Safety Act, a piece of legislation that UYC fought hard for and won under the Bloomberg administration (Dignity in Schools 2013). We used this data release as an opportunity to begin the conversations with candidates and make their positions on safety public. For the first time in the mayoral race, candidates stood with UYC calling for an end to the racial disparities in suspensions and arrests and calling on the DOE to change its discipline policies. Then Comptroller John Liu, Bill Thompson, and Bill de Blasio (then public advocate, now mayor) publicly urged real policy change. Soon after, Anthony Weiner jumped into the mayoral race but could not separate himself from his outdated, inefficient, and harsh education priorities. Using this new momentum around racial inequality in discipline, UYC leaders turned to other mayoral candidates to collaborate on specific pieces of our discipline and policing in schools work: Bill de Blasio co-authored a letter to the DOE with UYC’s senior coordinator, specifically advocating for restorative justice, social and emotional supports for students, and eliminating the overuse of suspensions as a disciplinary response. The letter was released to the press the day of the annual public meeting for changes to the New York City Discipline Code. Weeks later, then–Speaker of the City Council and candidate Christine Quinn launched her proposal to shift school climate and policing in schools. UYC leaders stood with Quinn, urging a new Memorandum of Understanding (MOU) between the New York Police Department and the DOE, to ensure that schools are limiting their reliance on police for minor, non-criminal misbehavior. This launch came a week before UYC launched our MOU campaign with allied partners. In a matter of months, from April to August of 2013, all Democratic candidates understood that punitive discipline policies do not reduce conflict or get at the root of behavior problems and instead can lead to students falling behind and dropping out. Without the incredible work of the UYC young people, discipline and school safety would not have been a priority for both the Democratic candidates and the new mayoral administration. School discipline is a racial justice issue, and we made that known. In October of 2013, the Annenberg Institute for School Reform at Brown University partnered with the Fund for Public Advocacy, the nonprofit arm of the New York City Public Advocate’s office, to organize a conference on parent and community engagement aimed at surfacing effective policies for the next mayor to implement. CEJ and other advocacy groups took an active role in planning and facilitating the conference, which was attended by 150 parents, advocates, and community members and featured speakers from across the country as well as then–public advocate and mayoral candidate Bill de Blasio. The conference brought together successful models of parent and community engagement from across the country (plus the United Kingdom) to share their practices and lessons for New York City. Then participants spent the afternoon in “world café” breakout groups discussinghow the new mayor could increase family engagement and what changes in policy would help enable those policies. Out of the conference, a Working Group on Parent and Community Engagement was formed to turn the ideas from those breakout groups into recommendations for the next mayor. It was fortunate that during the course of carrying out the conference and working group, public advocate de Blasio, whose staff was deeply involved with planning the conference, became a front-runner and then victor in the New York City mayoral elections. The recommendations were released in the last days of December, before the new mayor took office. As this issue of VUE goes to press, CEJ is advocating to see them implemented. The 2013 election cycle marked a pivotal moment in education organizing in New York City. For parents and students alike, this meant an all-in, united strategy to build a system that would put students and community first. To win big, to shape a community narrative that built off the powerful history of organizing of parents and students, and to move a progressive national education agenda, UYC and CEJ led a multilayered campaign with grassroots leadership, innovative community engagement processes, and effective policy recommendations. The year 2013 was the beginning of a process in New York City. The year 2014 will be about implementation. 1. For more information on these campaigns and UYC, see Moore 2011, UYC 2007, MTRNY 2008, and www.urbanyouthcollaborative.org. 2. For more on this two-pronged strategy, see Billy Easton’s article in this issue of VUE. 3. For more on the PS 2013 campaign and the bus tour, see Fiorella Guevara’s article in this issue of VUE. Dignity in Schools. 2013. “New Data Show Decrease in NYC School Suspensions, But Next Mayor Still Has Work to Do,” DIS. Make the Road New York. 2008. “High School Students Win Second Student Success Center,” press release, MTRNY (May 25). Moore, J. 2011. “No Transportation, No Education!” Voices in Urban Education 30 (Spring): 5–12,. New York City Coalition for Educational Justice. 2007. New York City’s Middle- Grade Schools: Platforms for Success or Pathways to Failure? New York: NYCCEJ. New York City Coalition for Educational Justice. 2008. Our Children Can’t Wait: A Proposal to Close the Middle-Grades Achievement Gap. New York: NYCCEJ. New York City Coalition for Educational Justice. 2011. “CEJ Wins Tutoring Services for 48,000 Students,” NYCCEJ (January 24). New York City Coalition for Educational Justice. 2013. “CEJ Announces $5 Million WIN for Supports Following Test Score Drop,” NYCCEJ (September 27). Urban Youth Collaborative. 2007. Student Success Centers: Expanding College Pathways in New York City Public Schools. New York: UYC.